SAN JUAN DEL SUR, Nicaragua -- The view out over the expansive Pacific from the forested hilltop was vintage, travel-poster Central America — the scallop-shaped Bay of San Juan del Sur, complete with its trademark 45-foot high fiberglass statue of Jesus de la Misericordia, glistening in the morning sunlight. 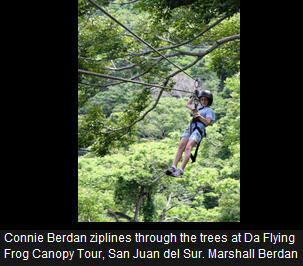 Not that my wife, my 11-year-old twin daughters, and I had much time to enjoy it before Pedro, our equipment-laden guide at Da Flying Frog Canopy Tour, indicated that it was our turn again to step off the elevated metal platform and take a zipline through the trees. But our exhilarating, two-hour airborne spree certainly had the girls grinning from ear-to-ear — and their father smiling inwardly at the exceedingly reasonable $30 per person price tag. 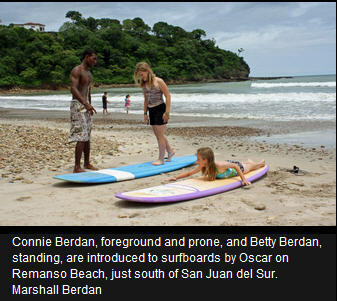 Squeals of delight were traded for glows of accomplishment that afternoon during their two-hour introduction to surfing lesson at Playa Remanso, one of San Juan del Sur’s justly famous surfing destinations. While Oscar, fluent in English, guided the girls through board basics, my wife and I monitored their progress. We alternately bobbed in the gentle green surf and documented the lesson with our camera from the rocky beach. It was indeed a banner day — the single best day, in fact, of our do-it-yourself, three-week tour of Nicaragua, Costa Rica, and Panama. And there would be an additional treat for us that evening: a spectacular sound and light show tropical downpour as we sat in the power-outage darkness sipping Tona beer at a beachfront restaurant. Ironically, Nicaragua was the only one of the three countries I’d had qualms about taking the family to, which is why I had made it our first destination ... just in case. Despite its reputation as “the new Costa Rica,” I was still concerned about personal safety and anti-American sentiment in the country that for years had been the subject of State Department travel warnings. We were, after all, the country that had supported ruthless dictator Anastasio Somoza, then tried to undermine elected President Daniel Ortega by clandestinely funneling money to the Contras. Nor was I convinced that Nicaragua’s infrastructure was ready for anyone other than seasoned backpackers equipped with plenty of time and patience. But times have changed in the most central of Central American countries. Overt political turmoil has abated (Ortega was elected to another four-year term in November), the economy is back on its feet, and thanks to a well-funded and well-managed tourism development campaign, Nicaragua is poised to receive independent travelers looking to expand their regional horizons. To be sure, the vast eastern part of the country still presents plenty of challenges, even to intrepid travelers. But the road south from the Managua to the Costa Rican border is both well traveled and well marked, a fact I was relieved to discover shortly after landing at the capital city’s international airport. Managua itself, a city tag-teamed in recent years by earthquakes, fires, hurricanes, and civil war, is of minimal interest to leisure travelers. We took a quick look around the city center, including the site of the Somoza dynasty’s palace, now surmounted by an enormous silhouette of rival Augusto Cesar Sandino, who was executed here in 1934 and for whom the Sandinistas are named. Then we caught a clean, fast, and cheap (about $1.50) express microbus down to the colonial capital of Granada, where, for fear of not being able to find a decent place to stay on our first night, we had made advance reservations. We needn’t have bothered. In addition to its aesthetically restored 16th and 17th century colonial ambiance, Granada is rife with perfectly suitable hotels, inns, and guest houses. Ditto for its restaurants, many of which can be found along the pastel, shop-lined Calle La Calzada, which runs from the quintessentially Spanish Parque Central with its mustard-colored cathedral down to 100-mile long Lake Nicaragua, Central America’s largest (by far) inland body of water. Over a plate of traditional vigoron (pork rinds and yuca) and the first of many bottles of cold Tona (or Victoria) beer that first night, I was finally able to relax, secure in the knowledge that Nicaragua was indeed ready for prime time and my family. The next day we leisurely took in the sights and sounds of Granada, including the view over the red-tiled rooftops towards Mombacho Volcano from the tower of La Merced Church. The girls enjoyed testing the hammocks being made in the annex at Tio Antonio’s Social Center, while at the Dona-Elba Cigar Factory, my wife and I each got to roll a verdadero organico, enclosing the local filler tobacco in a shade-grown wrapper from our native Connecticut. An evening stroll down by the lake completed our day. Reassured by the microbus trip down from Managua, we decided to try our luck on an ordinario (typically a surplus American school bus) down to San Jorge, departure point for ferry service out to volcanic Ometepe Island. The friendly Nicaraguans were crammed in as tightly as the ayudante could squeeze them, doing their best to diminish the unpleasantness of the hot and bumpy trip. Popular music blared from the souped-up sound system. 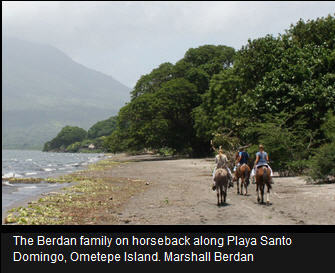 If our ordinario ride was a sensory overload for the nose and ears, the island of Ometepe was one for the eyes. A lopsided, figure 8-shaped island anchored by the tapering twin cones of Volcanoes Conception and Maderas, Ometepe is downright spectacular from most vantage points. But it is exceptionally so from the modest lakeside lodge where we stayed on Playa Santo Domingo, the thin beach on the east side of the central isthmus where, if you wade or swim out into the warm, greenish water (which we did frequently), you can see both at the same time. Climbing either is a lengthy, physically-demanding proposition, one that was not in keeping with the spirit of our relaxing family vacation. So we settled for a private tour of the island’s archeological museum — with its celebrated pre-Columbian petroglyphs — by curator Manuel Hamilton Silva Monce, and an afternoon horseback ride that included a dip at a natural spring and a sprightly canter along a black-sand beach. By American standards, our horses were small and scrawny; but then so was the price — only $10 per person. Indeed, for many travelers, Nicaragua’s most compelling attraction is its price tag, which, generally speaking, is half of what similar quality accommodations or services cost in now firmly-on-the-beaten-path Costa Rica. On Ometepe in particular, we ran into dozens of young Americans and Europeans, intent on getting the most vacation for their money. To a one, they were satisfied with their success. By the time we arrived in San Juan del Sur, Nicaragua’s most popular destination, we were no longer Nica novices, but well-versed in the art of negotiation. By agreeing to spend two nights and pay in cash, we snagged a deluxe room at one of the town’s fancier establishments for about half the printed price. During the California gold rush (and long before the Panama Canal), this otherwise sleepy natural harbor had been the Pacific port of embarkation for impatient prospectors who had traversed the Central American isthmus via the San Juan River and Lake Nicaragua. By contrast, today’s onslaught of foreigners come to stay, often for weeks on end, their days spent boarding at the beach and their evenings overlooking it, drinking in one of San Juan del Sur’s celebrated sunsets. We, too, would have liked to have stayed longer in this delightful and accommodating country, but I had let a little fear of the unknown get in the way. That’s one mistake I won’t make again — my daughters will see to that! Getting there: American Airlines and TACA fly nonstop from Miami to Managua’s Augusto C. Sandino airport (MGA), a 2 1/2-hour flight; roundtrip airfare from $370 midweek in late April. Or you can fly Spirit Airlines nonstop from Fort Lauderdale (three flights per week) beginning at $267. An alternative, especially for those who wish to include the mountains and beaches of northwestern Costa Rica in their trip, is to fly into Liberia (LIR), Costa Rica (daily nonstop flights from Miami on American beginning at $716), and work your way up the Pam-American Highway (50 miles) to the border. When to go: There are two distinct seasons in Nicaragua: The dry season, November to April, which can be quite hot and dusty, and the wet season, which runs from May to October, when the rain can last for days, disrupting travel. Prices — and crowds — tend to be highest during the North American winter, though San Juan del Sur is at its busiest during prime surf season, June-August. Many of Nicaragua’s better accommodations, especially in Granada and San Juan del Sur, are foreign-owned, with prices that reflect that. Options range from spartan hostels for $5 per night to posh resorts at more than $200. Off-season prices can be 25-40 percent lower and it’s always worth a shot bargaining, especially if you are paying in cash with U.S. dollars. In Granada, we stayed at La Islita Boutique Hotel (www.laislita.com, 305-759-5278, 011-505-2552-7473; Low season: April 9-Nov. 20, $50-$65, high season: Nov. 15-April 8 $60-$75), a charming, traditional posada well off the main square with a rooftop terrace. The girls probably would have preferred the spacious Hotel Granada (www.hotelgranadanicaragua.com; 011-505-2552-2178; $90-$115) with its enormous pool, but had it been just my wife and me, we would have opted for the Hotel Plaza Colon (www.hotelplazacolon.com, 213-908-1472, 011-505-2552-8489; low season: April 1-July 31, Aug. 21-Sept. 30 $89-$209, high season: Nov. 1-March 31, Aug. 1-20 $99-$209), a former colonial mansion fronting the Parque Central. Options in San Juan del Sur range from surfer hostels to posh resorts, with distance from the beach being as important as amenities in determining price. One of the most attractive no doubt is the centrally located La Posada Azul (www.laposadaazul.com, 011-505-2568-2524; $90, holiday rates: Dec. 18-Jan. 5, April 2-8 $150). For something special, check out either the graciously elegant Victoriano (www.hotelvictoriano.com, 011-505-2568-2005; low season: May, Aug., Oct. $90-$120, high season: March, April July, $150-$200), a rambling, 100-year-old bungalow once owned by the Somosa family) right on the beach or the opulently modern — complete with infinity pools — Pelican Eyes Resort and Spa (www.pelicaneyesresort.com, 310-776-9364, 011-505-2563-7000; Tropical season: April 9-Sept. 13, Sept. 17-Dec. 15, $180-$360; holiday season: March 30-April 8, Sept. 14-16, Dec. 16-Jan. 15, $240-$430) overlooking it from on high. Traditional Nicaraguan food is safe, filling, and — with entrees generally between $5 and $10 — invariably a delight to American wallets. Prices are well-posted, with the most memorable dining experiences occurring in colonial residences or sidewalk cafes. Local beer, rum, and soft drinks are plentiful and cheap. Choosing a restaurant is half the fun, and your selection is as likely to be based on the wait for a desirable table as it is on menu and prices. The best advice, therefore, is to go where there are plenty of choices and shop around. In Granada, that means the pedestrian Calle La Calzado where you can find everything from traditional Nica kitchens (entrees $3-6) to the elegant seafood-serving El Tranvia (entrees $15-$20) in the Hotel Dario, a former colonial-era mansion. In San Juan del Sur, head for the beach where several dozen popular combination bar/restaurants look out directly over the water, and thus include one of the town’s famous sunsets. For something away from the all-too Western and noisy surfer crowd, try Mediterranean-inspired El Colibri (entrees $8-12), set in a quiet garden, or romantic La Cascada (entrees $10-15), set above it all at hillside Pelican Eyes resort.